Every Monday and Thursday, Sampat, Seema, Gokul and Mahadev eagerly wait for the doors of a toy library in their school to open. Here, they play games, tell stories, draw cartoons and even enact impromptu skits. Their school doesn’t offer such a luxury on other days and in Dharavi, Asia’s largest slum, where they live, toys are a luxury. Sampat’s father, a tailor, can afford to buy balloons for his three children on special occasions—but not toys. The Matunga library was set up six years ago while the one in Powai has been around for two years. They are two of the 26 toy libraries that have been operating in municipal schools in Mumbai. Ever since these centres opened, students’ attendance has gone up and administrators say there is a distinct improvement in their performance in mathematics and languages. The volunteers at these centres are trained at the city’s S.N.D.T. Women’s University and Nirmala Niketan, a college of home science and social work. These centres, part of a project called Khel Vigyan, are the brainchild of Devendra Shivlal Desai, founder and managing trustee of Children Toy Foundation, that celebrates 25 years of its existence this month. The son of a paper merchant, 61-year-old Desai still loves playing with toys andbelieves in sharing the joy of playing with underprivileged children who cannot afford toys. “Khel Vigyan centres can supplement the normal school curriculum," insists Desai. “We would like to set up such centres at every municipal school because students of these schools have hardly any extra-curricular activities. They cannot afford toys at home or join summer workshops to learn skits." It may take a while to spread the message of Khel Vigyan but Desai has already set up 260 toy libraries across 13 states, including Puducherry and Andaman and Nicobar Islands. “On the lines of traditional libraries and archives, the toy libraries can cater to the healthy intellectual growth of our children," says Desai. “The toys are not meant for only fun and entertainment, they are a very effective tool for teaching. They can educate the children, stir their imagination and boost their creative zeal." Desai, a bachelor, says he is particularly fond of children. What drives him is his passion for playing and his love for toys. “When I was 14 years old, I took a bet with my sister that I would not get married," he says. “I never regret this. After looking after so many toy libraries, where is the time for family?" According to Desai, his foundation plays the role of a midwife. It delivers the baby (toy libraries) and then the local bodies—be it charitable trusts, social welfare groups, old age homes, jails, hospitals, temples and municipalities—nurture them. For instance, Surat Municipal Corporation has been nurturing 35 toy libraries. Arthur Road Jail in Mumbai and Yerawada Jail in Pune host two such libraries. In Mumbai, Tata Memorial, St George, KEM and seven other hospitals run toy libraries in their paediatric wards. On an average, each library has 300 members. This means, about 78,000 children have access to the world of toys and games through these libraries. All members who take toys home are required to keep a refundable deposit of Rs100 and pay a monthly membership fee of Rs10. At hospitals and jails, the inmates use the facility and since they do not take toys home, they do not pay any membership fee or keep deposits. “I can’t call it a movement as yet but we can develop this as a movement if corporations come forward to support the cause," says Desai. Companies are indeed coming forward. The foundation’s first mobile toy library was on the road in 1998, courtesy Excel Industries Ltd and a few other firms. 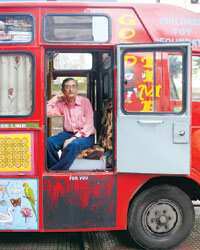 An ardent admirer of Mahatma Gandhi, Desai travelled across North India in October 1998 with the mobile toy library, going all the way to Jammu and Kashmir in an effort to introduce fun and games—and education—to thousands of children. Apart from hundreds of toys, the mobile vans play educational video films. There is also a projector to show films on a big screen and provision for hosting puppet and magic shows. Then, there are stamps and coins to encourage children to take up hobbies such as philately and numismatics. Children can even play with the colourful body of the van which has magnetic counters. The foundation’s first van, which is now nine years old, cannot ply in Mumbai any more under the road transport norms. So it has been serving 20 schools in hamlets surrounding Varanasi. It also toured 162 villages in Latur, about 400km to the south-east of Mumbai. Latur was ravaged by an earthquake in 1993 which killed 20,000 people. The foundation, in partnership with Godrej Sara Lee Ltd, now runs “Good Times Bus" service, carrying toy libraries to mobile creches, children’s hospitals and various construction sites where children of construction workers play with sand, stone and iron rods. “Our two mobile libraries serve 10 construction sites and 10 hospitals from Matunga Road to Dahisar in the western suburbs and Byculla to Thane in the central suburbs," says Desai. One more van will soon be on the road, courtesy India’s biggest engineering firm Larsen & Toubro Ltd. The foundation has also helped Vidyarambam Trust in Chennai to build two such vans that reached out to thousands of children in the tsunami-affected villages in South India. “Now, Share, another NGO, would like to make such mobile vans. We are also guiding Healing Hands, a women’s organization in Sri Lanka, on a similar project," says Desai. Toys and games have always fascinated Desai who, despite his elder brother’s insistence that he must complete his graduation before joining the family business, dropped out of college and chose to look after the warehouse of paper merchant R Desai & Co. at Fort, Mumbai, so that he could get time to solve the chess problems appearing in Ramji’s Chess Corner in The Timesof India. While Acharya Vinoba Bhave’s movement against cow slaughter and NGOs, such as Beauty without Cruelty, initially took his time and attention, Desai says he always wanted to do something different. He stumbled on the idea of setting up toy libraries by accident. In June 1982, he happened to visit the Chacha Nehru Toy Library at Petite Municipal School in Bandra, Mumbai’s western suburb. Established by Share Your Toy Foundation and adopted by the Lion’s Club of North Mumbai, it was a sort of local Disneyland, open to hundreds of students every Sunday. “I picked up an IQ puzzle but could not solve it," herecalls. “Another game, Memory Skill, excited me and immediately, I picked up a Make and Know game to build an aeroplane. I was 36 years old at the time but behaved like a child. I told the organizers to set up more such libraries but they could not do so." Without proper supervision, the Chacha Nehru Toy Library wasn’t making much headway. Very few toys were returning to the library in their original shape because of the overwhelming enthusiasm of children and, despite the consul general of Canada replenishing the stock and the then finance minister Morarji Desai exempting the gift toys from custom duty, the library died a premature death. Desai then opened the first toy library of the foundation, Khilona Ghar (toy house), in January 1984 at the Servants of India Society, an institute founded by Gopal Krishan Gokhle, at Parthana Samaj, central Mumbai. The cost of setting up the library was Rs22,000, with Desai chipping in with Rs5,000. The second centre was opened for the street children on the pavement at Fort outside Desai’s office. Here, nobody was allowed to take toys home but they could come every evening and play. At 7pm sharp Desai would be seen picking up the toys and keeping them in his office to bring them back the next day. Desai still dreams of spreading the message of the Khel Vigyan centres across municipal schools in India. He is also busy drawing up plans for Sunday family play centres where even privileged children can spend time with their parents, learning a few things. “The computers are robbing children of their childhood. I want them to play with toys at least once a week," says Desai. And, at heart, he still remains a child. When he is not travelling to set up another toy library in a remote Gujarat village or playing with children of construction workers on the magnetic body of the mobile toy library, he makes sure he indulges in a game of cards with Joy, a ragpicker and the first member of his pavement toy library, at the paper merchant’s warehouse on Shahid Bhagat Singh Road at Fort. Otherwise, Desai says, he simply cannot sleep at night.